“Love has so many ways to touch your soul and heal your heart. Love is the power that moves us beyond our individual concerns or doubts, sweeping us up into a divine field of energy that feels amazing. Love wants to flow through you, to create through you, to express itself through you. You are a love child of the Divine, and love is at the core of your being. Sometimes you will feel very close to this love, swimming in it, or like it is a fountain gurgling up from inside. At other times you will feel as though you cannot quite remember what it is to feel loving, to be loved. Then it is time to stop looking for love in all the wrong places, and turn within to find it. From the kindness, sweetness, affection and warmth within your own heart you will find great reserves of energy, creative confidence and bold trust to open your heart to love, to life, to your own unfolding life journey. So do not turn away from where your heart wants and needs to go. Let your mind relax. It doesn’t need to understand everything or be in control of the process of falling in love – with life, with a person, with yourself, with a purpose. In fact, if you are to truly fall in love, then your mind will not feel in control at all! The heart has its own wisdom and special type of feeling intelligence. It knows how to be swept away. It understand the difference between unhealthy obsession which prevents you from resolving the underlying issue of pain, and healthy, passionate, fierce devotion to that which sets your soul on fire. Love has its own wild ways and they are brilliant and instinctive in a way the mind cannot always grasp. So trust what you heart loves, what moves your heart, what makes it beat faster and love more. Then you will find that all sorts of strange wonderfulness, creative chaos and bold colour emerge from within and dances around you. 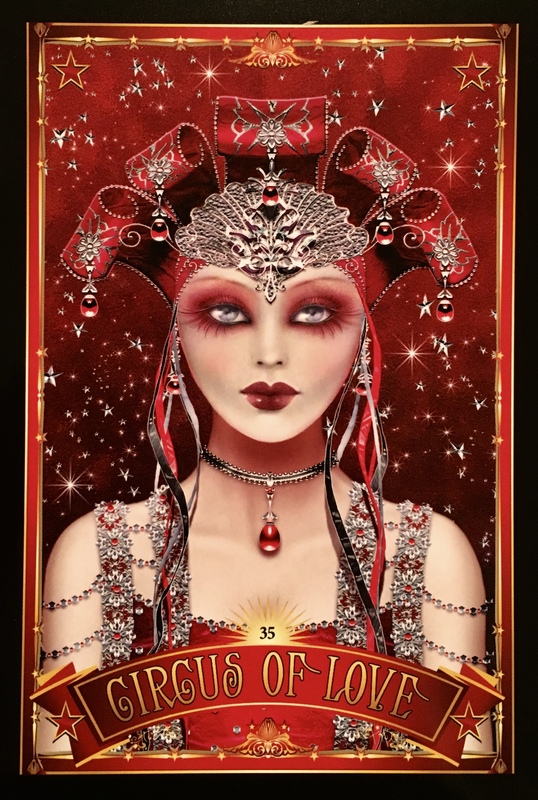 Your life may begin to feel like a circus, but what could be a better circus than a circus of love? Place both hands lightly over the center of your chest, near your heart. Feel, visualize, imagine or pretend that there is a golden light beneath your hands creating a soft, warm feeling of love. As you relax, that soft, warm feeling of love expands easily and rapidly in all directions, until it is expanding past your body. Feel, visualize, imagine or pretend that it reaches all the way out to the edges of the universe where it bounces back to you, amplified, many, many times. It pours back to you. You feel like the universe is giving you a hug! We are here to anchor the energy of Divine Love onto the planet. And in doing so, we are to experience this love also in our lives. From within as well as from external source. How you love yourself will be mirrored back to you by those who have agreed to assist you on a soul level. If we are in relationships which are not healthy, are toxic or are one sided, it is because we have not seen our own self-worth. We have not committed to loving ourselves unconditionally. We are not accepting of ourselves. Now there is something sacred coming to you. A love beyond all others. Are you ready for it? If there is “housekeeping” to do, do it now. Release that which no longer serves you, including all the old, toxic patterns, people, situations, belief systems and internal self-talk. Let it all go and open your heart. Aim high, do not lower your standards any longer; for yourself and for others. Know that you are worthy to be treated with love, respect, kindness, passion and honesty. Know that the love coming to you can offer you all of these things. It may be from a new lover. Or it just may be that once you shift how you think and feel about yourself, everything and everyone shifts with you, creating something new. Oh, I love the hug from the Universe! That’s a good healing. Happy Solstice Dee. Thank you so much! !